beer school » Blog Archive » Join us on the Beer Bus! Join us on the Beer Bus! 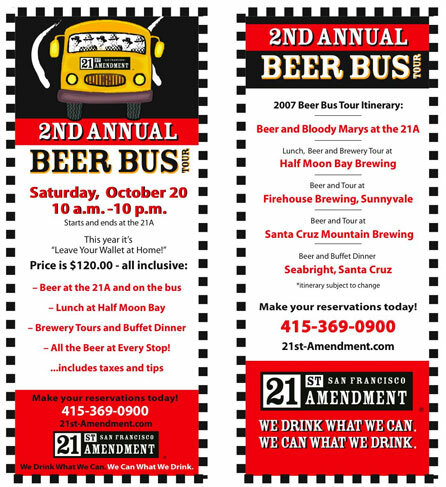 The 21st Amendment is sponsoring a Beer Bus to the south bay breweries that we normally never get to. The cost for the entire trip is $120 which includes beer, food, and the bus for the entire day. Once you get on the bus you won’t have any other expenses. That is unless you buy a t-shirt at every stop! But who would do such a thing? To get on the bus just stop by or call the 21A for a resevation. The number is 415-369-0900. Don’t wait because it will fill up. If you’d like to get an idea of what the day might be like check out this video that the Brewing Network made during last years trip.